Ian Stannard (Sky) got the better of a trio of Etixx-QuickStep riders to win a second consecutive Omloop Het Nieuwsblad. Having made the select group along with Tom Boonen, Niki Terpstra and Stijn Vandenbergh, it had looked as though the Sky rider would be outnumbered and worked over by the Etixx teammates, but a mixture of his strength and the others’ tactical errors saw him overcome the odds and win. Boonen put the first attack in with 4.5km to go, but Stannard, though hesitant at first, gradually clawed back to his wheel. Then Stannard put in his own attack, taking Vandenbergh completely out of contention and leaving Boonen dangling a tantalising few seconds behind him. That left Stannard and Terpstra to contest the sprint, with the latter in the advantageous position of being able to follow Stannard’s wheel. But Terpstra opted to start his sprint very early, allowing Stannard to use his slipstream up until the final few metres, where the Briton edged ahead for the win. Etixx-QuickStep will rue not winning having dominated the day’s racing. Boonen asserted his dominance as per usual with an attack on the Taainberg, and later on the Leberg – around 40km from the finish line – forced the selection that saw him, Terpstra, Vandenbergh and Stannard lead the race. A long pursuit followed between the leading quartet and a group containing Sep Vanmarcke (Lotto NL-Jumbo), Greg Van Avermaet (BMC) (with Etixx’s Zdenek Stybar sat on their wheel). The gap yo-yoed up and down but generally stayed at around 25 seconds – enough to force the lead group to continue to work hard, but not enough to suggest the gap was going to be bridged. Vanmarcke was unlucky not to make the lead group, having made the initial selection only to suffer a mechanical and drop back. His strong turns at the front and ability, along with Van Avermaet, to keep the lead group in their sights suggested he had the legs to win. To some extent Stannard has these two Belgian’s to thank for his win, as their ride forced Etixx’s trio to work harder than they would have liked, and left them visibly tired in the finale. Stannard will also be grateful for his teammates, who did a good job keeping him at the front for the first two thirds of the race. The bearded Bradley Wiggins and Bernhard Eisel rode near the front for long periods, while Luke Rowe forced others to chase with a brief attack on the Wolvenberg, 50 kilometres from the finish. Rowe went on to finish in ninth place. Stuck for words after such an epic race. Not into soppy tweets but super happy for Yogi. 9th for me, happy days! Epic effort from the team ! 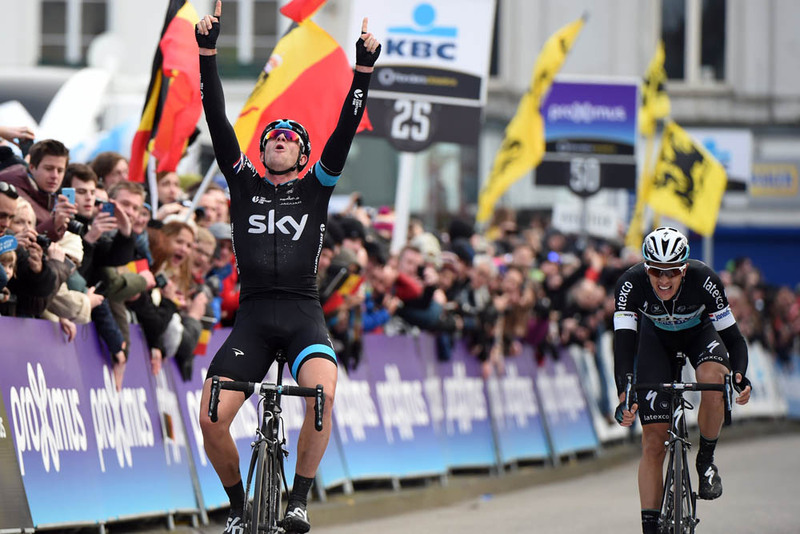 They will now turn their attention to tomorrow’s Kuurne-Brussels-Kuurne, with Stannard set to feature once more.